Black drivers in Kansas City, Missouri received 60% of traffic tickets written by the Kansas City Police Department in 2017 even though they comprise only 30% of the city’s population, reports The Kansas City Star. Ken Novak, a professor of criminal justice and criminology at the University of Missouri-Kansas City, attributes this disparity to the concentration of officers in high-crime neighborhoods which have more non-white drivers. Stacy Shaw, an attorney who has represented defendants in over 8,000 traffic-related cases since 2011, says the majority of black drivers’ tickets are economically based, such as for failure to pay insurance, licensing, or tag fees — not for “poor driver crimes.” To address these problems, she suggests the state create a sliding scale for car registration fees and that the city improve public transit. “Now it’s pay this ticket or pay this light bill. It’s pay this ticket or pay this rent. It’s adding another bill on top of what I already have,” says Kansas City resident Larena Bryant. Four years after the fatal police shooting of Michael Brown in Ferguson, MO and subsequent protests, black drivers in Missouri are 85% more likely to be pulled over than white drivers, reports Mother Jones and St. Louis Public Radio. This is the largest disparity since the Attorney General’s office began analyzing traffic-stop data in 2000. The report also uncovered significant disparity in how drivers were treated after being pulled over in 2017: Black drivers who were stopped were 51% more likely than white drivers to be searched and Latino drivers were 45% more likely than whites to be searched. Among those searched, white drivers were more often found with contraband. The investigative team learned that the majority of low-arrest areas are in low-income black neighborhoods. The police often blame insufficient resources, poor relationships with residents who distrust the police, and witnesses who fear retaliation from gangs. Community members and even some officers argue that it’s the police department’s apathy—with officers reluctant to leave their desks to gather street knowledge—that allow homicide cases to be left unsolved. Rev. Charles Harrison, who runs a nonprofit group that helps collect information to solve homicides in Indianapolis’s Crown Hill neighborhood, said, “I think families are frustrated because unless the case is solved very quickly, there doesn’t seem to be much communication after the initial homicide takes place…People have very little contact with the detective.” Police and community members agree that unsolved killings perpetuate cycles of violence. The city of South Fulton, Georgia is making history by being the first city where every criminal justice department head is a black woman, report The Atlanta Voice and CNN. 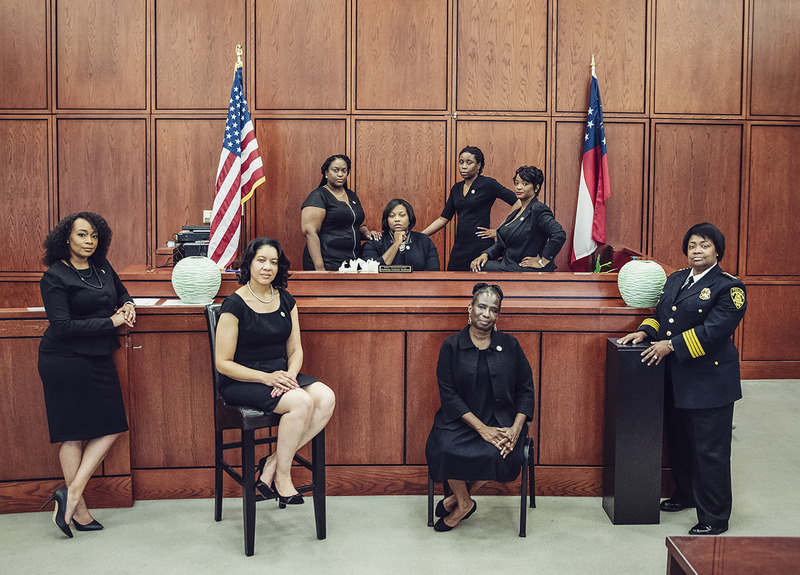 Chief of Police Sheila Rogers, Chief Judge Tiffany Carter Sellers, City Solicitor LaDawn “LBJ” Jones, and City Public Defender Viveca Famber Powell are among the team working towards an equitable justice system in South Fulton. “Our goal is to ensure justice for everyone. However, as African American women we are sensitive to the history of criminal justice in our country. We want to be an example of how to do things right,” said Chief Justice Sellers. The city, incorporated just last year, is Georgia’s fifth-largest and is almost 90% black. Under Chief Judge Sellers, the court gives everyone—including those charged with misdemeanors—the opportunity to receive appointed counsel and provides a robust diversion program. City Solicitor Jones oversees the pre-trial diversion program which allows individuals to keep a clean record in exchange for community service. “One of the primary purposes of laws is to protect citizens and the city. You can do that without sending everyone to jail or enforce high fees. Most people do better when they know better,” said City Solicitor Jones. The church, half of whose congregants are white, recognized that the rare instances in which it called the police were in regard to homeless black men. Rather than relying on police, church leaders secured a $10,000 grant to train its members and other community groups on de-escalation tactics and self-defense. For burglaries, the church will file a report at the police station to satisfy property insurance requirements, rather than have the police come to its neighborhood. While some churches have scoffed at this strategy and conservative media has called it “anti-police,” another church in Oakland and one in San Jose and Iowa City, Iowa have made similar vows and local houses of worship and residents have expressed interest in participating. Minneapolis police abruptly ended the practice of targeting small-scale marijuana sellers after the Hennepin County Public Defender’s office discovered that nearly every person arrested was black, reports the Star Tribune. Of the 47 individuals arrested and charged with felonies, 46 were black and almost all were charged with selling $10-$20 worth of marijuana. African Americans only comprise 19% of Minneapolis’s population. According to the Hennepin County Chief Public Defender, Mary Moriarty, the 46 black individuals arrested were all approached by police and asked to facilitate sales, while the one white individual arrested had himself approached an undercover officer about selling marijuana. Moriarty called Minneapolis Mayor Jacob Frey upon discovering the disparity, who then pledged to have the sting operations halted. The city’s police chief announced that the arrests were a result of sting operations that took place within the first five months of 2018. The County Attorney announced that all charges would be dismissed but had not agreed to expungement. A police spokesman said that officers will still make arrests for marijuana sales.